My web connection really slowed down. Once I got on my Verizon wireless modem setting online with one of their tech people, it turned out that along with my devices listed as connected there was also an Amazon device connected. I do not have an Amazon wireless device. 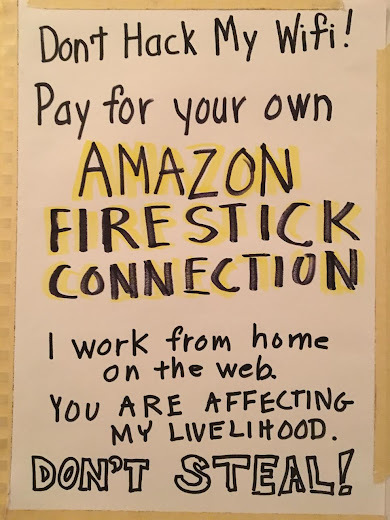 Turns out it is an Amazon Firestick, the device you connect to a TV to get Amazon streaming video. Verizon said that there are apps for phones now that can be used to figure out your wireless passwords easily. It is commonly done with Amazon Firesticks since they take a lot of bandwidth. Once I changed my password and wireless network name the device was no longer listed as connected. The tech said she changed her wireless name and password every other month due to this. The reader shared this because it "may save a lot of people aggravation." In the last week my wifi has slowed to a crawl. Ah ha. Ah ha... Wow. I'll check with Verizon. And I thought it was net neutrality rearing it's ugly head... and the ink wasn't even dry. Thanks for the info. You know, just make the internet free. Or, hire a tech guy for 30 bucks an hour to do it for you. @1:42 PM Actually Verizon, for one, will provide a modern modem and talk through password protection on the phone. I was leaving my modem open years ago until a streamer showed up and was maxing me out again minutes after I (re)booted them. There are no apps for smart phones to crack your wifi password. There are computer programs that do that. The problem here is the person had an open wifi or weak password, probably an older router was/is being used. The wifi thief is going to be your neigbor, since wifi signals do not travel well and far through walls. Remember a strong password is not a word but think of a passphrase. I had super slow internet a few years back and discovered my rooftop cable had a million splices in it. The cable tech had a good laugh as he held up the ball of cables. Curse the neighbors! @2:28 PM: That's exactly what I said - they'll give it to you for free. 12:07 - Verizon has been doing repairs in the area. Ours was so slow we finally decided to change to Spectrum. Also, you'll get better speeds if you run a wire from the modem to your computer. Make sure your router or modem/router combo is using WPA2-Personal for your security protocol. Many older routers or modem/router combos use WEP which is highly unsecure, and can be cracked rather quickly. Also, make sure your router or modem/router combo is up to date with the latest firmware. Make your Wi-Fi network name hidden ... even harder to guess both a network name and a password. You may have to threaten your provider to get them to make it hidden. Not sure if Verizon will, but Spectrum can. I was with Verizon for the longest time up until they had an outage back in July (I live on East 7th and 1st Ave). I was left without service for over a month that I had to switch to Spectrum. One of the best decisions I've made because Spectrum's internet is faster (up to 100MBPS) for the same price Verizon offers.